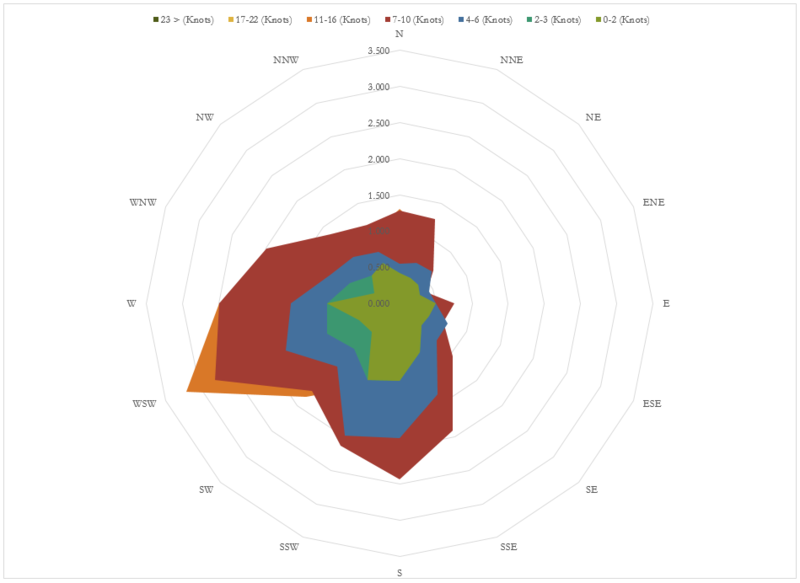 The process is fairly long and tricky, and the end result is not the professional Wind Rose that you would produce by simply purchasing WRE v1.7. However, in the name of providing a good service for our website viewers, we have include the procedure below. You will need to source the appropriate wind speed data which related to a specific location and, ideally, height. The data will need to comprise of mean wind speeds and the associated wind speed direction for that mean wind speed. For example, you may have access to hourly mean wind speeds and direction taken for the last 2 years. Perfect! Please note that wind direction needs to be converted from degrees to Cardinal Wind Directions i.e. N, NNE, NE, ENE, E and so on. Click here for more information. In order to do this you should ensure that any mean wind speeds which have values of 0 have been asigned the wind direction “Calm” (or something equivalent). This is explained further in the Data Sorting Instructions. Select your whole wind speed table and click the ‘Insert’ tab and then select ‘PivotTable’. Create pivot table in new worksheet. 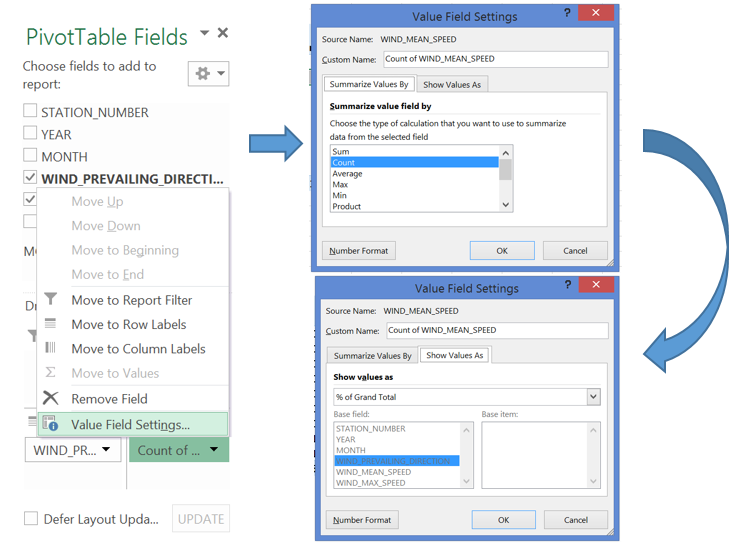 Drag the Mean Wind Speed field into the ‘∑ VALUES’ area of the Pivot Table Fields toolbar also. 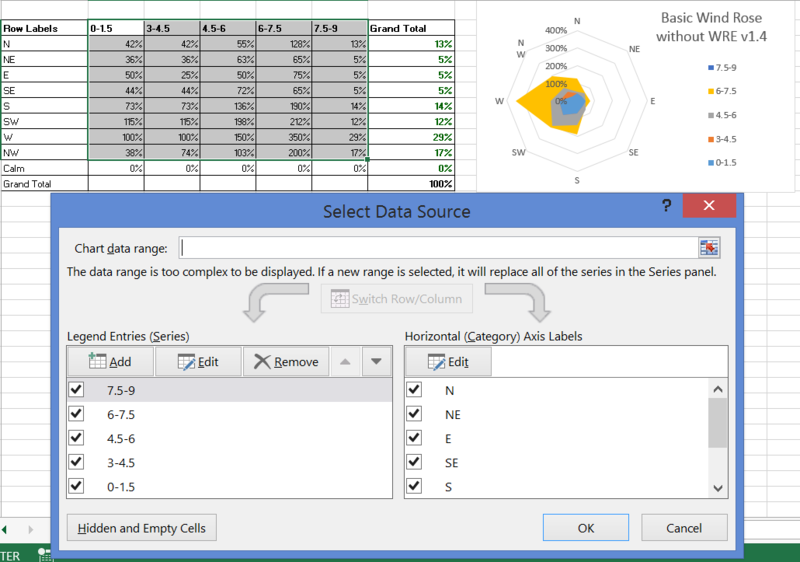 In the Pivot Table, drag the new Row Labels into the correct order, I.e. N, NNE, NE, ENE and so forth. In the ‘∑ VALUES’ area of the Pivot Table Fields, convert the frequencies into relative frequencies (each frequency / total frequency). Enter your range in the ‘Starting at:’ and ‘Ending at:’ fields, select your bin size in the ‘By’ field, and finally click ‘OK’. 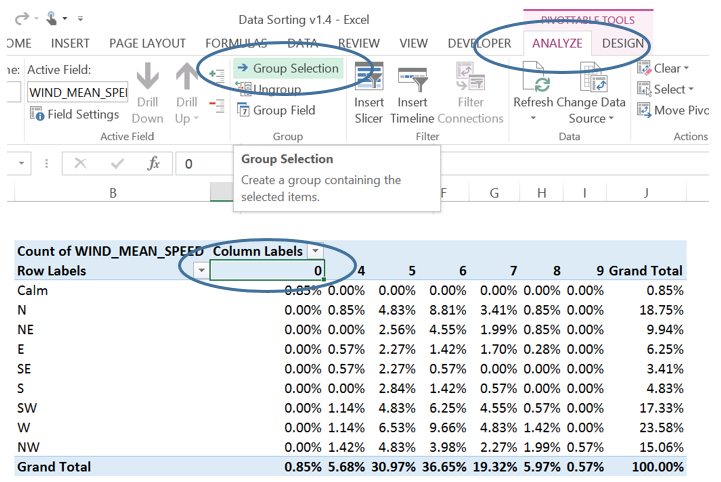 Copy and paste the data out of the pivot table into a separate worksheet.